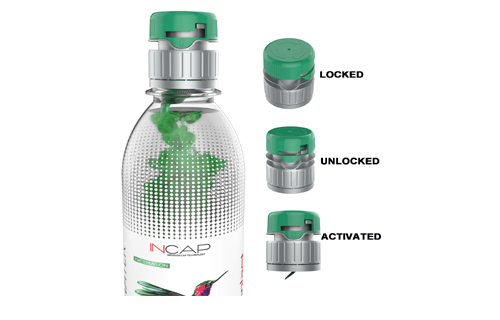 Refillable packaging for additives or decorative closure for convenience beverages – the new-generation dispensing cap from Incap Ltd. offers a host of new possibilities for innovative product design. Developed by an international project team, the versatile dispensing cap was turned into a point-of-sale product by two companies: Hähl and Teamplast. Consumers are prepared to pay more for functional beverages enriched with nutrients or health-boosting additives. This trend allows beverage producers to move into a lucrative growth market, more so as their product innovations also cater to another emerging trend: convenience products. Enriched with vitamins, minerals or probiotics, the new beverages offer on-the-go solutions, which can be conveniently consumed directly after a workout or during lunch breaks. In order to avoid the use of preservatives and prevent detrimental effects on or even loss of the effectiveness of additives after long storage, manufacturers have developed a dispensing cap that contains dry or even liquid additives in a separate chamber inside the cap. Twisting the cap, the consumer only triggers the mixing procedure when the product is about to be consumed. The patented, lightweight dispensing cap for PET bottles developed by Incap Ltd. now adds another benefit for beverage producers to the equation: maximum freedom of product design and additive options that can be tailored to individual consumer requirements. The dispensing cap is suitable for liquid additives as well as for granules, hot or carbonised bottled beverages. The there is more: as the bottom of the cap is hermetically sealed, it can be sold in combination with the beverage or as an additive refill product. Athletes can conveniently carry their additives in their gym bags, children can mix in apple or orange flavours while they are travelling on the back seat of a car – there is no end to the creative potential of this innovative product, as Axel Hauck, co-owner of Incap Ltd. explains. Fine-tuning within an international teamwork. This project is a perfect example of successful international teamwork. The German company Horst HählKunststoffspritzguss&Werkzeugbau GmbH and the Dutch plastics specialist Teamplast supported Hong Kong-based Incap Ltd. at all stages of product development right through to market maturity. While the new Incap dispensing cap has a complex design, it also meets a wide range of optical, tactile, safety and hygiene specifications and provides the required ease of operation. Featuring wall-thickness levels of less than one millimetre and an extremely complex geometry, the cap has to withstand high pressure and different temperatures. The sealing properties must not be jeopardized, particularly when carbonised beverages or hot liquids are being bottled. All project partners provided input for the processing-related fine-tuning. Hähl supplied expert information on prototyping and pilot moulds, Teamplast, certified expert for plastic closures, supported the manufacturer with constructive optimization measures to ensure profitable and efficient large-scale production. In order to meet the product’s exacting precision and repeatability requirements, Hähl carried out the production mould optimization trials on an all-electric Sumitomo (SHI) DemagIntElect injection moulding machine. Teamplast also ran their large-scale production with injection moulding machines from the German-Japanese manufacturer with headquarters in Schwaig near Nuremberg. The Dutch specialist operates at total of 30 Sumitomo (SHI) Demag injection moulding machines. How did Hähl and Incap come to be project partners? Mangold: We knew Mr Hauck from earlier projects. After we encountered problems with our prototyping mould in China, he suggested that his company Hähl take on the development of the prototyping mould as well as the optimisation, construction and final design of the production mould. Together with Teamplast, we optimised the mould for large-scale production. Why is precision such an important requirement for injection moulding machines? Mangold: The mould optimisation trials quickly revealed that the production of Incap dispensing caps required maximum precision in terms of dimensional stability and geometry of the carrier components, in order to ensure that the sealing properties of the membrane and the assembled carrier components were never jeopardized. The process safety had to be guaranteed at all times. This is why the 8-cavity production mould design was optimised –during pilot trials on an all-electric Sumitomo (SHI) DemagIntElect injection moulding machine. What makes Incap dispensing caps so special? 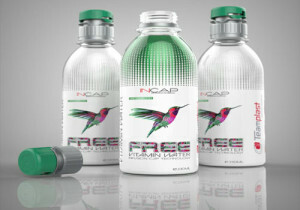 Hauck: With their special design, Incap dispensing caps are in a category of their own among competing products on the shelf. While consumers using our product feel that they are contributing to their health and wellbeing, they also experience this cap as a fun novelty item as these caps allow them to add the ingredients themselves and watch them dissolve in their beverage. Bottlers are impressed with the product’s versatility, which is why our caps are ideal marketing material. A beverage is so much more interesting if consumers can prepared their very own special drink.